Chanticleer, 30 minutes outside Philadelphia, has been open to the public since 1993, financed by a private endowment from the Rosengarten family who created the garden beginning a century ago. It is touted by many horticulturists as one of the best gardens in America. Five years ago a master gardener trip to Pennsylvania included the garden, which was a universal favorite. The new book is a behind-the-scenes story of how the seven full-time gardeners or horticulturists maintain the original gardens while enhancing them with new cultivars and new techniques. For instance, some of the expansive lawns have been replaced with meadows and taller grasses to improve sustainability. Each gardener is in charge of a specific area of the estate though they all work in concert with each other. During the “off season” they build garden furniture, trellises and fences while planning for the floral display from April to November. There are thumbnail biographies of the gardeners in the back of the book. “For the Chanticleer staff, art is an everyday experience,” writes Thomas who is executive director of the garden. “We are a garden; a place of beauty, pleasure and escape,” he adds. “A good garden is never static,” wrote the late Adolph G. Rosengarten, Jr., who created the foundation that owns the garden. He wanted visitors “to learn about plants, landscape design, and good gardening.” Today, “The entire property is a demonstration of gardening applicable to eastern North America and beyond,” according to Thomas. Thomas acknowledges that much of Chanticleer is a high maintenance garden. “No area of our garden can afford to have downtime: guests do not come to see bare ground,” writes gardener Jonathan Wright. “Plants make Chanticleer the garden it is, and it’s easy to see we are crazed about plants,” writes Thomas. The staff order from more than 70 nurseries and also receive plants, cuttings and seeds from around the globe. They must have a huge budget! Emma Seniuk has a particularly helpful section on choosing plants for the garden. “What can we do to make the planting sing?” is one of the questions she asks herself. Later in the book she comments that “Color is, after all, not just color….Rather than just commenting on a pink flower, the good gardener knows to acknowledge the bright yellow center, the matter purple foliage, and the delightful reddish hue in the petioles and stems.” One color combination that is pictured, I would like to try: red and white Tulipa clusiana ‘Lady Jane’ with blue-purple Muscari armeniacum and soft yellow Narcissus ‘Hawera’. All have small-scale flowers which should work well in a condominium garden. Another Seniuk tip is to cut tulips in bud so they last a full week in the vase. 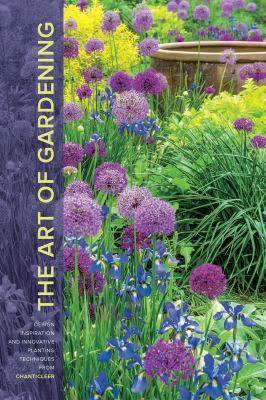 “The Art of Gardening” is a beautiful book that is fascinating to read and filled with tips for the home gardener. There is only one plant list in the book, but more lists are available online at www.chanticleergarden.org.